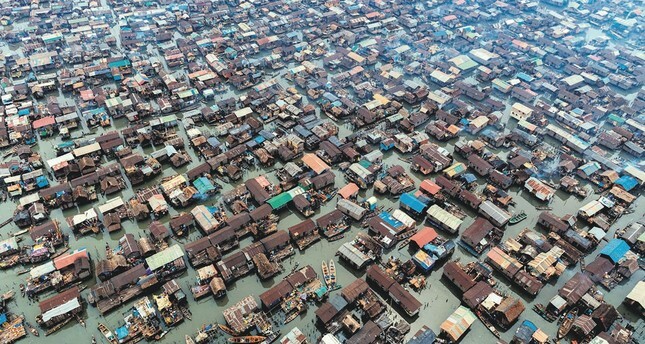 Photo shows Lagos city. English is mostly used in larger cities such as Lagos and Abuja while locals in rural areas prefer their local languages. While there were 520 indigenous languages spoken in Nigeria, the home of different ethnic and religious groups, in the beginning of the 1900s, today, the number dropped down to 450. According to academics conducting research on languages in Africa, one of the main reasons behind the erosion of local languages is the history of colonization, trade conducted only in certain languages and decrease in the population speaking the local languages. Academics from the Languages Department of Bayero University in Kano, Professor Usman Usaini Fagge, ProfessorIbrahim Garba Satatima and Dr. Aliyu Musa talked to Anadolu Agency (AA) on the languages spoken in Nigeria. Highlighting that the number of languages spoken in the country are decreasing by the day, Prof. Fagge noted that 520 indigenous languages spoken at the beginning of the 1900s have perished over the years and currently, the official language is English, with Hausa, Yoruba and Igbo being the commonly used languages. Prof. Fagge recalled the conference organized in Nigeria in 2014, which revealed that 450 tribes speak indigenous languages in Nigeria, thus there are 450 local languages currently spoken in Nigeria. After Nigeria came under the rule of Britain in 1914, the richness of languages spoken in the country started to decline. When the country gained its independence in 1960, English was accepted as the official language and using only English for all official transactions, procedures and education thus eliminated many of the languages that were spoken. English is mostly used in larger cities such as Lagos and Abuja while locals in rural areas prefer their local languages. Additionally, according to Prof. Satatima, as the number of citizens who speak indigenous languages is decreasing, any language under threat is bound to become lost. Stating that ethnic structure and language variability in Nigeria, which has a population of 200 million, is mostly due to the historical slave trade, Dr. Musa pointed out the impact of slavery on the richness of languages in the country. "The main reason why there are so many languages in Nigeria is slaves, who were being transported from Africa to America and Europe, to escape from slave traders, had to take refuge in Nigeria as they could not return home, thus, they contributed to the language richness of Nigeria," Dr. Musa said.